Just a couple of nights after landing a 11/1 NHL Accumulator we are once again waking up to yet another win on the US Sports! 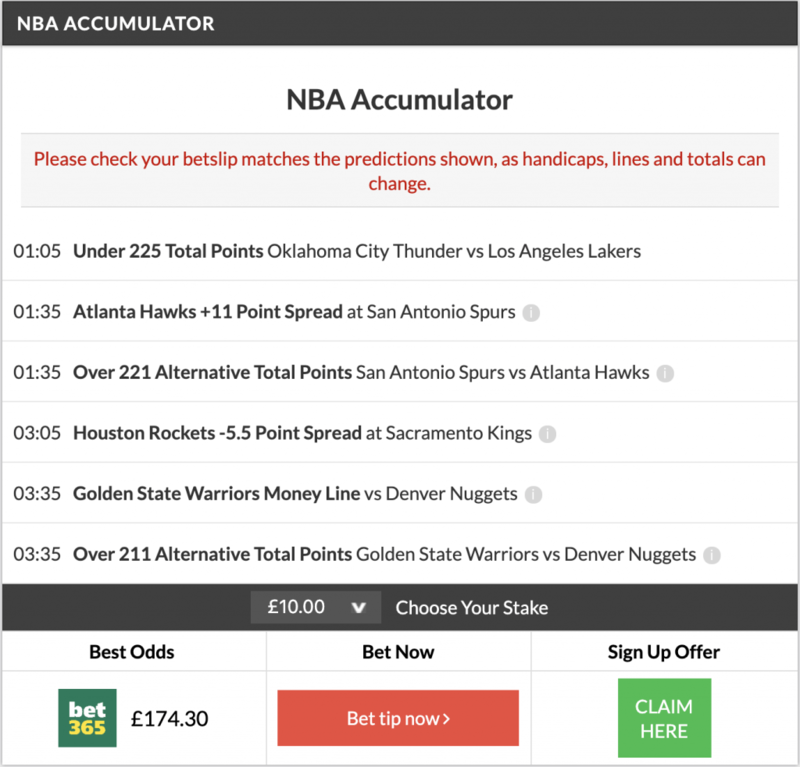 This time around our NBA tipster worked his magic and brought us a 16/1 Acca winner! The NBA tips have been on fire recently with the Double landing for the 9th consecutive time! 9th straight double winner lads! It was the Thunder and Lakers in the opening game of the Accumulator as we backed Under 225 Total Points to be scored. In a game marked by a 20-20-20 performance by Russell Westbrook, the Thunder won 119-103 which means a total of 222 pts were scored to land our first leg on the acca! Next up we backed Atlanta Hawks +11 Point Spread against the San Antonio Spurs which meant Atlanta could lose by 10 pts and our tip would still land. San Antonio won by 6 pts and our tip landed which made it 2/2 on the night. In the same game we had Over 211 Total Points as well and with the score being 117-111 we landed our 3rd tip on the Acca! A comfortable Rockets win over the Sacramento Kings got us to 4/4 on the night. James Harden once again dominated with 36 pts in a 130-105 victory for the surging Rockets. And finally, we had the Warriors to beat the Nuggets and Over 211 pts to be scored in the final game of the Acca. It was a battle for the 1st seed in the Western Conference and just as we expected, the Warrriors turned it up a notch and won comfortably in the end 116-102. It was their 26th home victory on the season, but more importantly it landed our 16/1 Accumulator!! The NBA playoffs are just around the corner! Be sure to bookmark the FREE NBA TIPS page so you don’t miss out on any future winners! Tips usually go up on the website in the afternoon hours!